The singular event that drew us to our first WOPN, like Monarch butterflies seeking the eucalyptus groves south of Pismo, was the Edna Valley Collective Dinner: six courses, masterfully created by Brian Collins, chef at Ember in Arroyo Grande, to pair perfectly with Pinot Noir wines from six Edna Valley AVA wineries: Claiborne & Churchill, Stephen Ross Wine Cellars, Niner, Center of Effort, Baileyana, and Tolosa. Imagine two days devoted to the nuances of Pinot Noir coaxed and encouraged from the best winemakers around the world. Rosé lunches and sparkling brunches, seminars, focused horizontal and vertical tastings, two Grand Tastings featuring more than 100 wineries, and special winemaker dinners with top chefs. A wonderful dream? No — this is the World of Pinot Noir. 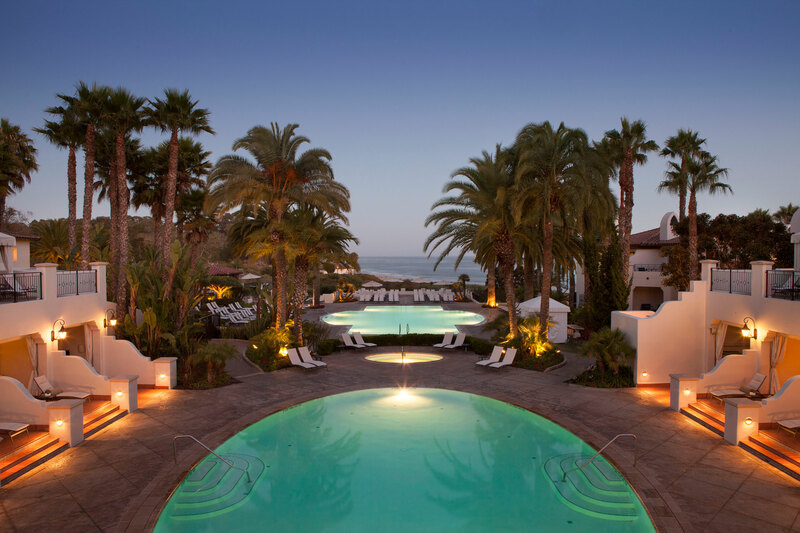 Santa Barbara’s lovely Bacara Resort and Spa was home to the 2017 World of Pinot Noir. 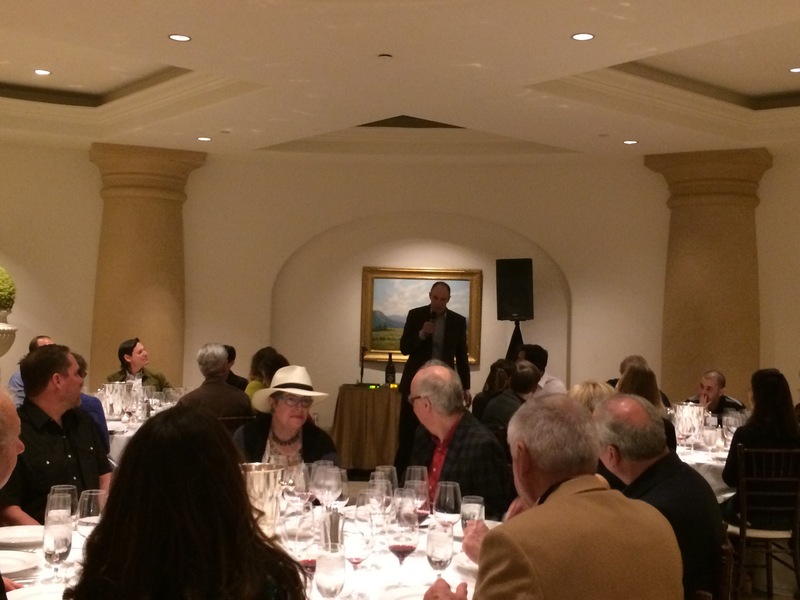 Held every spring, this year’s WOPN on March 3-4 celebrated the wonder of Pinot Noir once again at the lux Bacara Resort and Spa in Santa Barbara. The “world of” moniker was represented by wineries from Australia, Austria, Chile, France, Italy, New Zealand, and Spain. Domestically, several wineries from Oregon were joined by a full slate of California winemakers from Mendocino, Monterey, Napa, Sonoma, Santa Cruz, and Santa Barbara County — and our beloved SLO County. WOPN’s mission is to bring Pinot Noir producers from the most exceptional and unique regions in the world together with Pinot Noir enthusiasts from across the country for a weekend of celebration and education on the shores of California’s beautiful Central Coast. When looking at the WPON schedule of events the first time, it’s a bit overwhelming. What to choose? Attending the full two days is bucket-list worthy, but it entails a significant outpouring of time and funds. Fortunately for the Flavor Team, a recent impromptu second visit to Stephen Ross Wine Cellars brought clarity, thanks to co-owner Paula Dooley’s insights as a WOPN veteran. The Edna Valley Collective Dinner waiting for guests to arrive. If we could only choose one event, she suggested Friday’s Edna Valley Collective Dinner — a quiet, more intimate way to enjoy great wines, hear the winemakers’ thoughts, and spend an evening with others who appreciate our amazing wineries that may be local in geography but are world-class in quality and reputation. It was an easy decision. We ordered tickets the next day (sales close a few days before the event) and eagerly anticipated the first Great Flavors experience of WOPN. We arrived a little early to Bacara and had time to stroll through the grounds of the beautiful resort before the 7:30 start to the Edna Valley Collective Dinner. 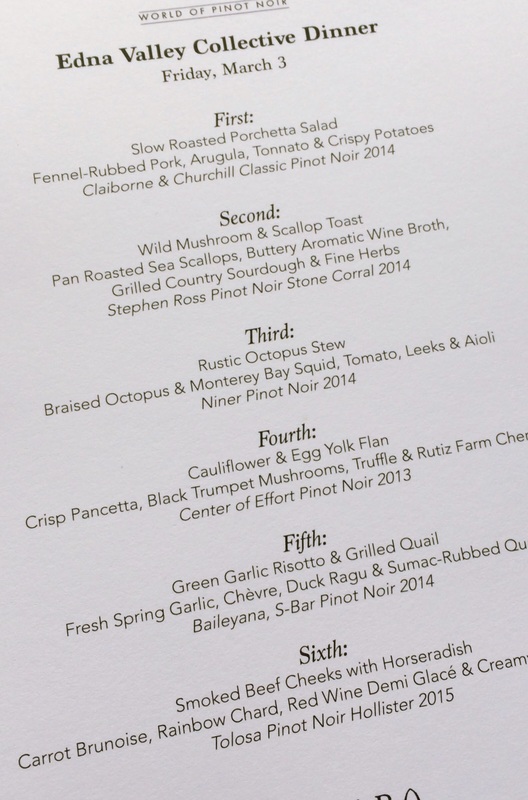 Menu of tonight’s pairings at the Edna Valley Collective Dinner. 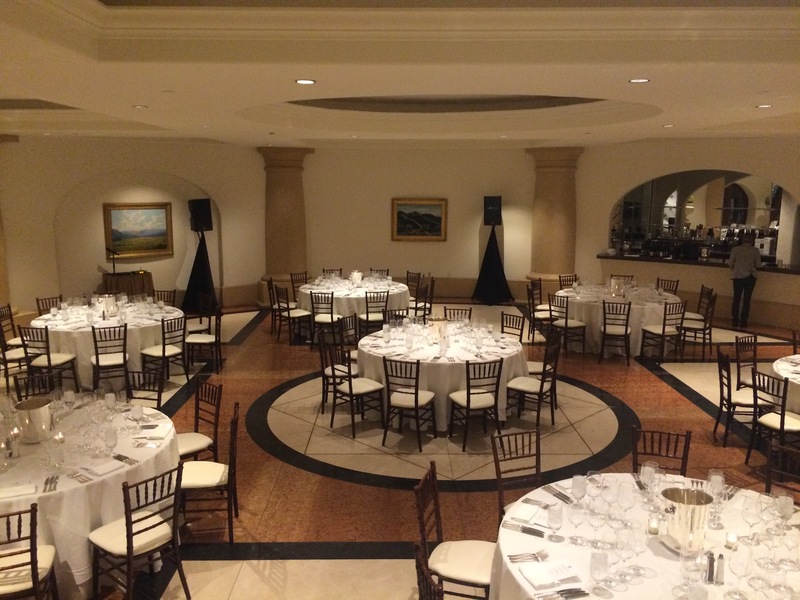 Held in the Directors Lounge area, the round 10-top tables showcased three sparkling wine glasses marching from the rim of each dinner plate toward the large silver wine tasting bucket in the center of the table. Tucked into the napkin at each place setting was tonight’s delicious agenda: six courses, masterfully created by Brian Collins, chef at Ember in Arroyo Grande, to pair perfectly with Pinot Noir wines from six Edna Valley AVA wineries. Before dinner started, we learned a bit about the Edna Valley Collective. This group of Edna Valley AVA wineries has the shared goal of becoming the best resource for information about all that makes the Edna Valley unique. Through generating and sharing research on the Edna Valley AVA, it highlights and communicates the unique qualities of the wine region to relevant audiences. Six superb Edna Valley AVA wines waiting their turn in the evening’s pairing lineup. The Edna Valley AVA is small — about a dozen wineries — so it’s not surprising (or highly surprising, depending on how you look at it) that the winemakers seem to share a collective spirit of mutual continual improvement of the wines that represent their AVA and the camaraderie of developing more recognition in the industry. 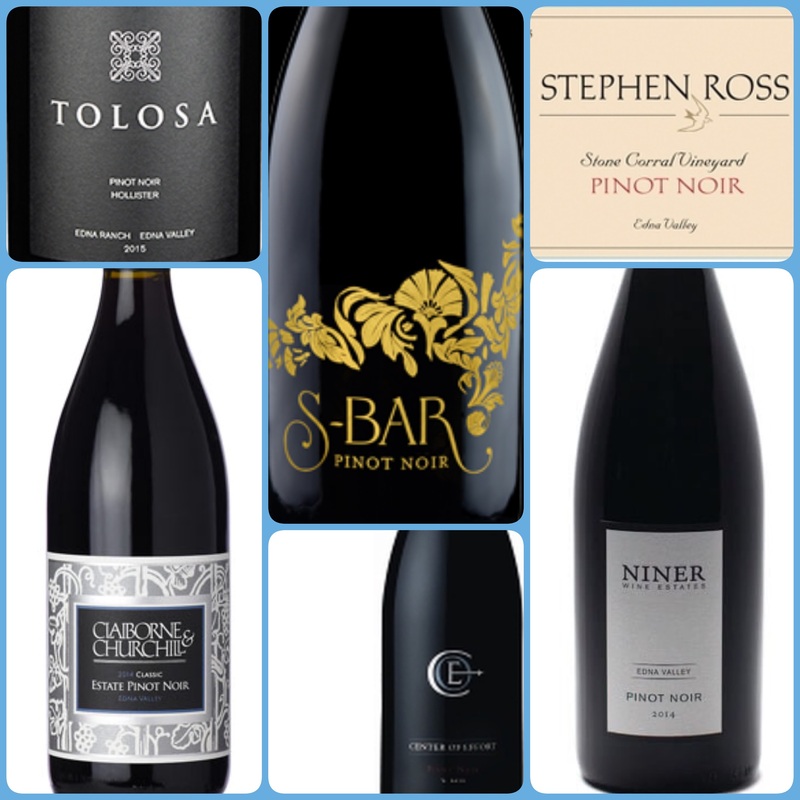 Winemaker Stephen R. Dooley of Stephen Ross Wine Cellars discusses his Pinot Noir Stone Corral 2014. After Sommeliers poured the wine for each course, the winemaker shared thoughts about the winery, their journey as a winemaker (by the way, there must be something in the water of Minnesota… a whole lot of winemakers have ties to the Land of 10,000 Lakes), this particular vintage, or other thoughts. Everyone then turned to the serious delight of experiencing the next course’s pairing. Divine is the word that explains every one of the six courses. Here’s what we sampled. 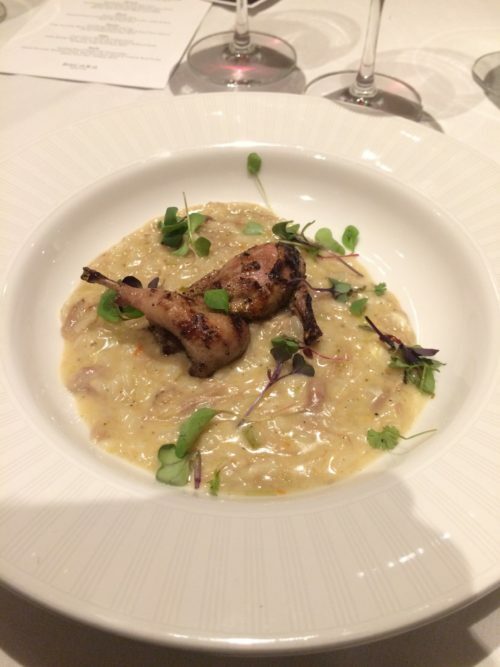 Course five: Green Garlic Risotto with Grilled Quail, prepared by Ember Chef Brian Collins. Over the six courses, we experienced the alchemy of each pairing and noticed the changes in the wines. From lighter to more robust as the evening progressed, each wine captured the expressions of its maker and terroir. So interesting how different “the same” wine can be. As the last dishes were cleared from the table, the prevailing feeling in the room lingered: like-minded, warm-spirited colleagues enjoying time together, talking shop, and underpinned with unwavering appreciation of and support of each winemaker’s efforts. As we heard (and tasted) several times during the evening, Edna Valley is making exceptional wines; its time in the industry sun is very near. We’re looking forward to the dawning of that day and the Edna Valley AVA getting the recognition it deserves. Between now and then, we are excited to visit and share more about each winery with our community. With its superb wines and wonderful people, and set in one of the prettiest places on the planet, the secret will soon be out. Mark your calendars now and join Great Flavors at next year’s World of Pinot Noir event: Bacara Resort & Spa March 2-3, 2018. The Flavor Team will see you there. Did you attend this year’s WOPN? What was your favorite event? Did you discover an exciting new winery? Tips for navigating a Grand Tasting? Please share a comment here or on our FaceBook page.